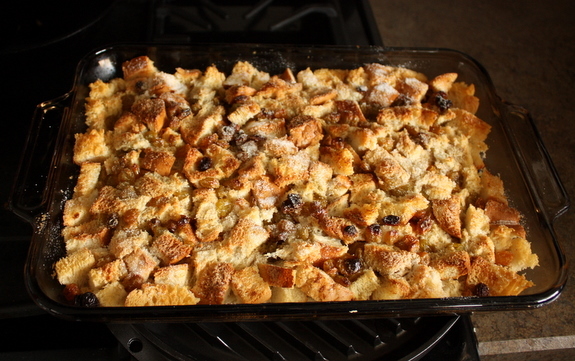 Sometime over the long, long, LONG winter I’m not quite done with, I became obsessed with bread pudding. I don’t know how or when it happened, but it did and there’s no help for it. So instead of getting up to run on the treadmill at each hotel I stayed at over the course of the last 5 months, I ordered bread pudding from room service everywhere I went. Makes sense, right? A girl’s gotta preserve her food stores to last through winter. I’m happy to report that my food stores fat stores are in healthy order. So when I came across a bread pudding recipe in Family Fun I knew I needed to take it firmly by the hand and get to know it a little better. You might want to take notes. Preheat your oven to 350 degrees. 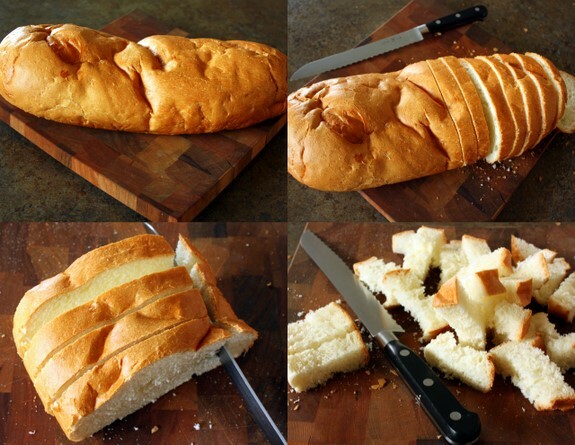 Cut up the loaf of bread into tiny one inch chunks. It seriously helps if the bread is at least a day old so it’s easier to cut. Plus, if it’s a little on the dry side it will better absorb the delicious pudding. 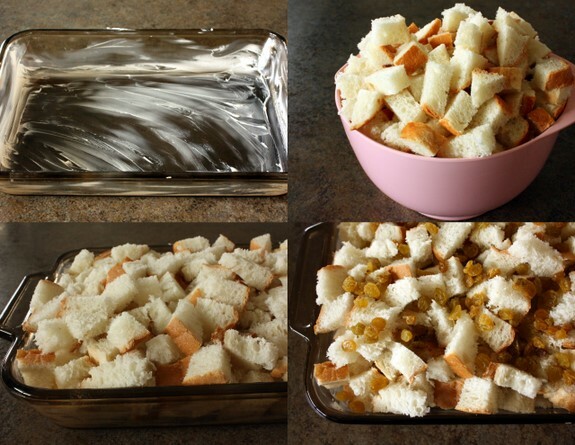 Butter a 9 x 13 baking dish and layer the bread cubes until the pan is completely filled. Sprinkle the raisins on top. 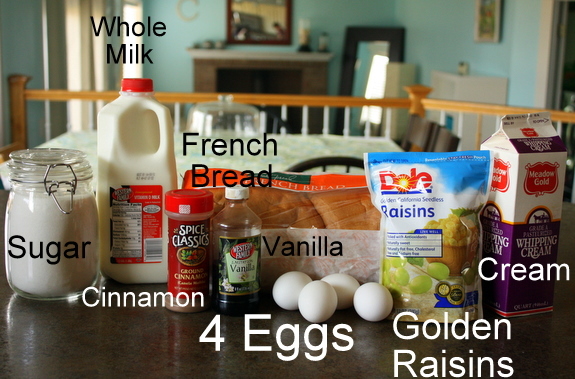 I added a few extra because I’m a raisin lover and they get nice and chewy when you cook them. YUM. 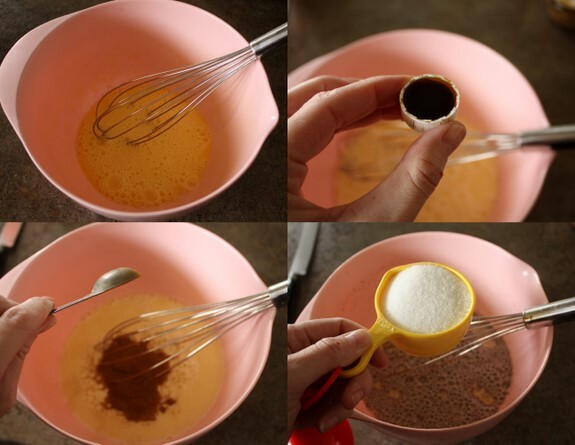 Whip the eggs until thoroughly beaten, and then add vanilla, cinnamon, and 1/2 cup of sugar. Mix all of that until totally combined. Now add the milk and the cream. 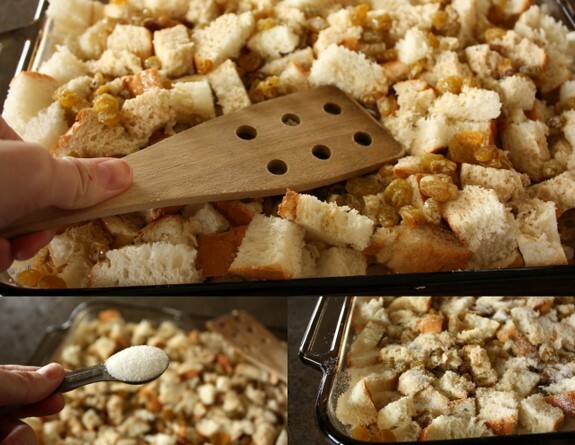 Pour the whole mixture over the breadcrumbs and let it sit for about 15-20 minutes so the bread has time to really absorb the yum. After things have absorbed a little, take a wooden spoon and smush down the bread until it gets at least a little immersed in the milky mixture. 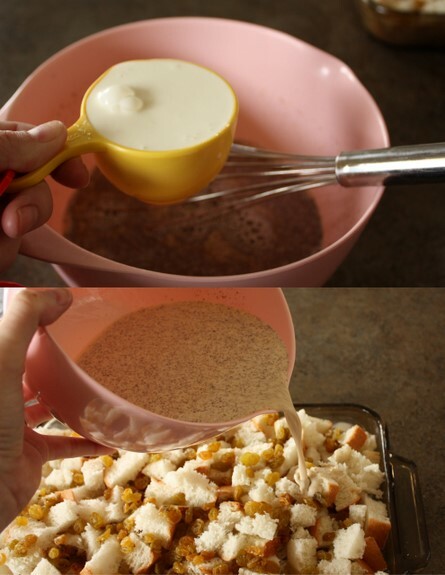 Now sprinkle that extra 2 tablespoons of sugar you’ve been holding onto all over the top. Place the pan inside another pan in your oven. Just like a custard you need to sort of boil the bread pudding instead of straight up cooking it. I don’t have a pan bigger than a 9 x 13 so I used a cookie sheet. Once everything is in the oven use a tea kettle or water pitcher to fill the cookie sheet with as much water as it can hold. It smells like a really delicious cinnamon french toast. Add a little dollop of whipped cream on top, and indulge your sinful food lust. I’m not responsible for anything past this point. Just to note for next time, I’d probably at least double the liquid contents of this recipe. I like my bread pudding super moist and this was a little dry. Still, with enough whipped cream I managed okay. Yum. 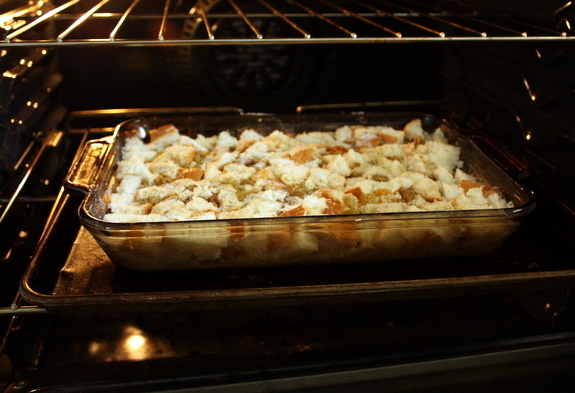 I, much like you became obsessed with bread pudding over the winter and made a very similar bread pudding recipe. Instead of the whipped cream I made a sauce (recipe below) from an amish recipe I found on-line – it was amazing. It soaks in for that moist taste that I love too! Oh my, yous sounds delicious. We are a bread pudding family. I’ve had bread pudding on a regular basis my whole life!! Mike loves it, but I rarely make it for him. But he gets it every time my mom is in town. So last night, she made me LOW FAT bread pudding using egg whites and fat-free evaporated milk!! She is a SAINT. Much to everyone’s horror, I added a sprinkling of chocolate chips to mine. Mike added some fresh raspberries to his. To each his own. Mine was DELICIOUS and I am ready for round two. I adore bread pudding. Back when ZCMI was around, they had a cafe. And the ZCMI bread pudding was my favorite. Thick and moist and raisiny, with the most glorious custard glaze slathered over the top. I still dream about it. Now, the only place I know I can get bread pudding consistently is Chuck-a-rama. Which means I need a kick-A recipe. I will try this recipe for sure. 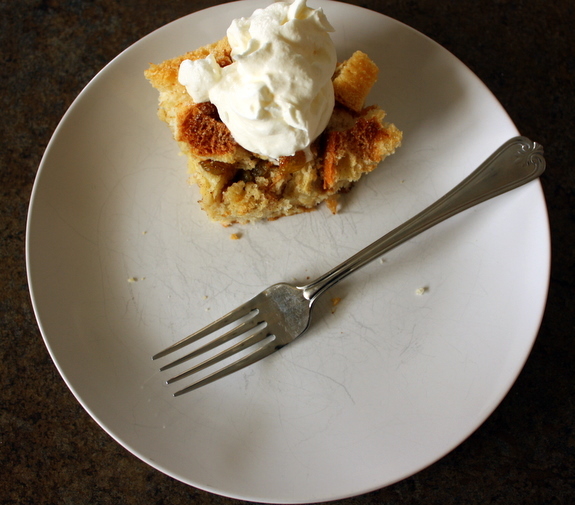 I always thought bread pudding sounded disgusting so I never tried it–until I was on a job interview. We were at a fancy shmancy restaurant & they told us we MUST get the White Chocolate Bread Pudding. 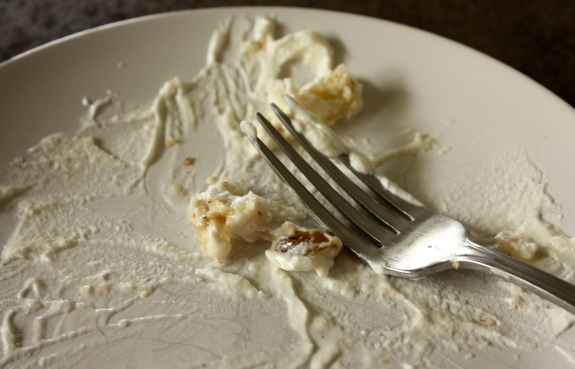 While my husband was talking to our prospective employer I scarfed the bread pudding. Poor guy got 1 bite. I am a huge fan of bread pudding, and PW’s is the absolute BEST one I have tried. Hands down. You HAVE TO make the sauce. The sauce makes it. It’s insane! 1) Bread Pudding is just as glorious in March and April. 3) Raisins, when baked in a creamy bread pudding, become totally different creatures. Super plump and juicy. Almost grapes, except sweeter and more flavorful. I accidentally struck gold the first time I made bread pudding, using Epicurious’ Warm Bourbon Sauce Bread Pudding recipe but with different bread. We bought a new bread from a local bakery, a dense multigrain loaf with nuts. It was horrible on its own, but in the pudding, it balanced the bourbon and cream with a rich, nutty, grounding flavor. (It was also a healthy choice. Um, sure, I planned it that way…) You’ve inspired me, so I’ll have to make it again and add it to my blog’s “Hungry” file. Oh, mama! Now I’m getting your bread pudding obsession, and why you must order this from room service at midnight!! Looks awesome!